The Chauffeur ~ Chauffeur Driven Executive Vehicle For Any Occasion Throughout Buckinghamshire. Specialising in weddings and business travel, The Chauffeur also provides for evenings out, theatre trips and airport transfers. Indeed, any occasion that requires a little luxury and style can be catered for. When you book with The Chauffeur, you will receive the highest quality service, the most prestigious chauffeur driven vehicle, and a smartly dressed driver who will ensure your trip is safe and efficient. Our wedding service is second to none, ensuring that your needs are attended to. The vehicle will be tastefully decorated to your requirements, making your day more memorable for all the right reasons. 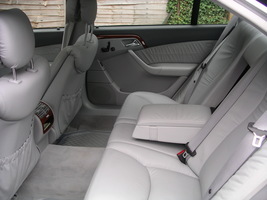 The Chauffeur ~ Travel in luxury Using One of the Most Prestigious Vehicles in Buckinghamshire. 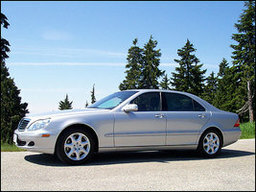 The choice of vehicle made by The Chauffeur is the luxurious Mercedes Benz `S` class. The vehicle is beautifully appointed with the most modern luxuries including heated and reclining front and rear seats and climate control. The extended wheelbase and air suspension ensures that clients travel in comfort and reach their destination fully refreshed. Naturally the vehicle is maintained to the highest standards and is fully insured and licensed.